Discussion in 'Firearms and Hunting' started by Think for myself, Aug 16, 2011. This is a debate myself and a coworker have been having. What is the best home defense gun? 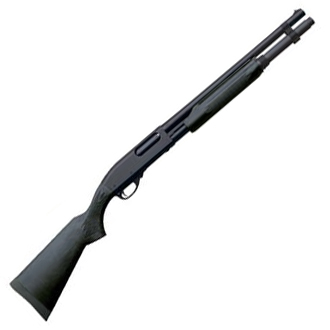 The first is the Remington 870 12ga. with the extended mag tube. Shot will not go through your walls and the neighbors. Does not need to be aimed precisely. Clumsy to turn with, and if in a hall the gun will not be pointing where you are looking if you do have to turn. Next up is the Glock 19 9mm. Holds enough rounds to stop anyone. Bullet will carry a bit. Now experience has taught me the 870 works just fine when it comes to stopping a burglar, or in my case 4 that were breaking into a trailer. Plus I am comfortable with shotguns. My coworker swears by the 9mm. ibobbrob, Jason Bourne and (deleted member) like this. Doug_yvr and (deleted member) like this. Yeah, why not lollipops and puppy kisses? Sorry, but I will fling lead while you watch reruns of Kung Fu. 870 all the way, especially since most home invasions happen at night. I'd rather have the weapon that is more forgiving when it comes to aim. Packs plenty of punch too. Neither, we have this. Saves us everytime. But seriously, it's what you do in the situation that matters. Not the weapon. The best bet is to get your cell and call the police. Finally, someone with some common sense. It's not really that hard. Chances are it's not some burglar trying to swipe something. It's somebody who's already figured out what they're going to do. Unless what they're after is in your room, you're safe. They'll go in and get out. That's for squares. How can you encourage intruders when you have a "Protected By Broadview" sign in front of your house? Say you'll give them a free puppy? For me it is a mossberg 5500 semi automatic with a pistol grip and 18 1/4 inch barrel loaded with 3 inch magnum deer slugs. Guaranted to to stop anything that it hits and yes it will go through walls. If you are in my house and looking down that barrel it is already to late for you. Jedimiller in a star wars speedo standing in my front lawn!! There is no way anyone is coming near my house with that defense mechanism in place!! Ethereal, submarinepainter, (deleted member) and 1 other person like this. Didn't realize you had a swimming pool in your front lawn. A revolver that can fire .45 or 4-10 ammunition. Perfect for the home, the car, and the street. A decent security system is all you need, and locks on your doors and windows. No gun is necessary. Shotgun. No need to aim. Are the criminals in certain states able to bypass a high tech security system? The answer is yes when there are too many criminals and not enough police. I agree...shotgun all the way. I have other guns as well...but for home defense I go with my semi auto remington 1100 and have never had any issues. PS...I also have a 95lb pit bull as well. He even scares away the people I want to come over. Albert Di Salvo and (deleted member) like this. Shotgun all the way. Reload time is irrevelant, because once someone hears that distinct sound of a shotgun shell being chambered, they are heading for the hills. Any scatter gun will be a better choice than a pistol. More control, broader target range. It's not easy to maintain control in the face of a threat. Adrenaline surges, heart races, hands shake. The shotgun is the best bet, by far. I can understand the guns, but I prefer a Big Dog or two (because they make good alarms and can even stop them in their tracks) and a baseball bat. Of course, a little dog could be a good alarm to (loud bark), but they're not going to be intimidating, let alone stop them dead in their tracks or rip them a new one. just that numbers tell a different story sometimes.